COLUMBIA, Mo 4/16/18 (Feature) -- We are often closer than we think, as two stories by the Columbia authors Ibtisam Barakat and Alex George illustrate. 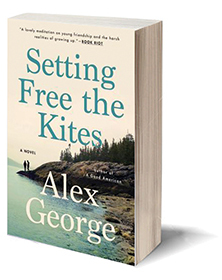 Fierce, eighth-grade defenders of the weak -- Nathan Tilly, from Mr. George's novel, Setting Free the Kites; and Ms. Barakat herself, from her essay Beating a Bully -- protect friends and family from bullies at elementary schools worlds apart. At odds for the past week over the things that separate them, the memoirist and the novelist reached a rapprochement Friday. The founder of Columbia's Unbound Book Festival, Mr. George apologized for misbegottenly micro-managing an Unbound panel discussion with Ms. Barakat last year. Internationally-renowned for her memoirs, Tasting the Sky: A Palestinian Childhood and Balcony on the Moon: Coming of Age in Palestine, Ms. Barakat said she was unfairly censored during an "author conversation" with the short story writer Rachel Hall, best-known for Heirlooms, a collection of short stories about four generations of a Jewish family. "Admin has questioned me in regard to literature I've taught and has effectively shut me down so that when I teach Cry, the Beloved Country or The Grapes of Wrath, I do not draw parallels with Palestine." But literary parallels between the U.S. and Palestine are certainly there to draw. In Mr. George's novel, Nathan Tilly protects new friend Robert Carter from bully Hollis Calhoun in Maine. In her essay, Barakat protects sister Maha from the bully Nahida in Palestine. "I was in the eighth grade and my sister Maha was in the fifth grade when our family moved to a new town...We had lost the only home we had owned shortly after the 1967 war in Palestine," Ms. Barakat writes. "I did not like leaving all of my friends behind and made sure everyone knew that...I don’t know what Maha felt...she was a shy girl and hardly talked back about anything." The "popular girls" at Barakat's new school "stretched their words as they spoke through chewing gum; coiled their long hair behind their heads, like spare tires on the backs of army jeeps; held gossip sessions about someone they knew and I didn’t. Nahida's bullying further isolates the two sisters. "During recess...I was sharing a sandwich with Maha when Nahida snatched the food from my hand and began to eat it. When she was done, she threw the rest on the ground and left. Nahida was bigger than me and looked older. That made me scared to say anything. Maha, who often walked with her head down, now covered her face and began to cry." Robert Carter is in a similar fix, "on the first day of my eighth grade year at Longfellow Middle School" in Maine, Mr. George writes. "For most of the previous year, Hollis Calhoun had bullied me without mercy. He undertook a campaign of terrors small and large," from rib jabs in the cafeteria to "more elaborate, sustained cruelties" with "fists, heavy and huge." Carter first sees Tilly, the new boy at school, sitting "bolt upright in his chair...hair as black as the leather on my mother's Bible...he turned and looked right at me. New arrivals were to be treated with extreme caution..."
Parents in both stories are treated with caution, too. Fear of telling an adult enables the bullies to terrorize at will. "Mom had told us in the beginning of the year that if we got involved in any trouble, she would take us out of school," Barakat writes. Nahida meanwhile continues to "seek out and hit" Maha "almost every day." "I had spent much of the last three months anxiously imagining what abominations Hollis had in mind for me," Robert Carter says. But enough eventually becomes enough, and school-day interventions occur: Nathan Tilly versus Hollis Calhoun and Ibtisam Barakat against Nahida. "I could no longer tolerate my fear of Nahida or her beatings of Maha," Barakat writes. "Maha stood on the playground...Nahida ran up and hit her. She pushed a couple of girls aside and pulled Maha’s braid to the ground. I ran to Maha. When Maha looked up and saw me, she started to sob loudly. "That made me forget my fear. "I found myself turning to Nahida, and I threw my entire body against hers. Nahida fell to the ground. I got up and slammed myself on her chest." Calhoun's comeuppance comes in a restroom stall, where he grabs Robert Carter's hair and pushes his head into the toilet. "He held my head firmly...as water sluiced through my mouth and up my nose," Carter tells us. "I felt the prickle of tears at the corners of my eyes. "Just then, there was a loud bang...The door of the stall had been flung open. Standing there was the new boy," Nathan Tilly. 'Let him go!' he yelled. He began kicking Hollis in the shins...hammering his fists against Hollis' chest...He was no match for Hollis physically, but what he lacked in strength, he made up for with sheer ferocity." The confrontations work. Maha "no longer walked with her head down," and though Hollis Calhoun has another comeuppance coming, the fear lifts from Robert Carter, too. Three girls in Palestine; three boys in Maine: So far apart and yet, so close. Stories like theirs that bring the far but familiar home -- a common scourge, the good fight, a big win for the little guy and gal -- help make written words among the strongest ties that bind, and reason to celebrate at Unbound this week.